My idea with this series is to concentrate on capturing the steps leading up to the final product of an artwork. Showing viewers that sometimes the process can be just as beautiful as the end result. The materials captured are not the most pristine, which I hope adds to the image, making something that doesn’t seem worth taking note of, beautiful and intriguing. Through use of the aforementioned along with diagonals and movement I hope to show the viewers that sometimes the process can be just as beautiful as the end result, by creating captivating images that draw the viewer’s eye into the pieces. 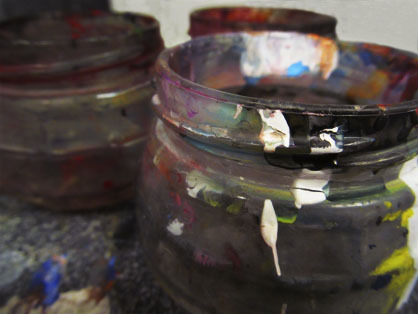 Although the top photograph is in focus of the closer part of the jar, the depth of field you have and the mix of composition and colors makes this photograph almost look like an abstract painting. Very impressive. However, the bottom photograph seems like your ISO might have been a little high and I am not sure the focus or intent of your photo. I think it might be a good idea to crop part of the right side off? The left side of the bottom photograph is beautiful. These close-up shots are very nice, especially on the boards seen from a different angle. I even like the lighting on the jars since it stands out from the paint on it, sort of like complimenting it in a way. I really enjoy these images. The colors are what originally caught my eye, along with the fact that it is not fully apparent what they are at first glance or what their purpose is. It’s neat to see that other people are intrigued by things such as paint on a jar or wood as well because I often think it can be beautiful, but I never thought to stop and photograph it as anything more than a progress picture of my own work. These truly capture the beauty of creating… nice job! This series is definitely one that any artist can identify with. While paintings and subjects are ever-changing, the materials that we use often look similar to what you’ve captured here. The shadows in the first image could be lightened up a bit, however, I do enjoy how because it is so dark, the white paint really jumps off the screen. I do agree with Anne and that maybe a bit of the right side of the bottom photo could be cropped as a way to focus in on the beauty in the bottom left. Great photos! As an artist this image is easy to relate to. These close up shots really emphasize the process that we go through to get to an end result. I do agree that the shadows in the top photo could be lightened a bit. I do really enjoy both images, and the feeling that accompanies them however the second image is my favorite – the leading lines really pull me into the photograph and allow me to focus on all of the detail and color. I think these are easy images to relate to as artists, but I don’t quite see how they examine the process of making art since they seem to exhibit the raw materials that go into a piece instead. I’m not sure what the other photos in your series are, but the concept may come across better if you were to take photos of a work in progress or ink slathered on a silkscreen-something that might relate more to an action instead of a still life. This is an interesting take on the behind the scenes of the processes that artists go through to create their artwork. Your idea is strong but I feel that your images lack a bit in understanding this. They are great up-close shots of materials used by artists but they don’t really connect the audience to the artist themselves. I feel that you could achieve this better by stepping away from the scene and looking at it as a whole. 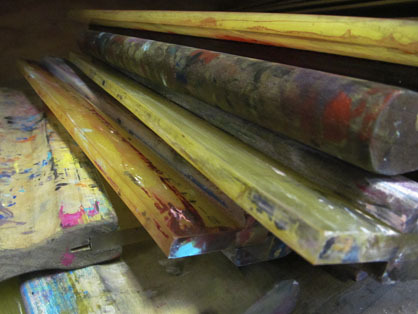 Think of ways to really connect the work to audiences because as an artist myself I understand these images but to someone on the outside they have no idea that the second image is a squeegee used in screen printing. Overall they are good images but you can expand more the on the idea. Great idea for your photographs in this project. I like the concept behind your pieces and think you did an overall great job capturing what you wanted to. In terms of composition and aesthetic, I think it could have been nice to see a short depth of field in the second picture in particular, like you do in the first. I do also think that the lighting is a bit dull in both of them. Perhaps in your editing you could brighten up the images if you did not have access to more light. Overall though, great job in accomplishing your objective noted in your artist statement. The first image is more successful than the second. I particularly like the emphasis placed on the jar via both the short depth of field and how it is partially cropped out of the frame. After looking at both compositions and reading your statement I couldn’t help but think how great this concept is. The fact that every piece of art is more about the process than the final piece itself is a reality in art. It is true that it takes a lot for an artist to bring an artwork into its final stage and you did a wonderful job representing it with this image. Colors, Light, Movement are just a few things that are working really well in these two photographs. I really enjoy both of these pictures because of all of the paint on both of the objects. With the shots being so close up it brings your attention to the paint spots on the objects. If these were taken from a farther away angle then I feel like you would not bring the attention to the paint spots and you would have things in the background. I really like the cop of these pictures. There is something quite sinister about the lighting in these pieces. They are presented uncomfortably close to their subject matter, adding to the feeling that these regular artistic objects are shown in a way that isn’t entirely natural. It’s much like looking at crime scene photos. The second photo suffers from being slightly out of focus on the right half. It’s not so detriment in the first photo, where the further away jar is blurry, but the second photo has continuous objects that would be better if they were the same crispness. I really enjoy the different perspectives you give us through these images. You realize that it is everyday objects but the way you shot the pictures make it less boring and the more you look at it the more colors you realize are present in the image. Fun! I like how you capture the same essence throughout the images: the paint splatter. I think your images could have been more in focused and saturated. It would be really neat if you made a massive collage of these types of images!